I taught little ones in church for years. I joyfully told the story of creation to the 1-4 year olds who responded with absolute love to the Creator who fashioned them and declared them Good! I loved sharing how what God created was all designed to be with Him all the time and how we are made in His image and therefore are good. Right? Oh boy. This week I’ve looked around and wondered about God declaring anything “good”. I convinced myself that although we were created in His image, we have messed things up so badly and we have degraded what was created to be beautiful. Watch the news – – you’ll see what I mean! Evil, hatred, killing, kidnapping and even natural disasters just in case mankind isn’t bad enough. There just isn’t much good left. A friend I’ve known for years passed away from cancer. Another friend mourns the loss of her daughter. Someone I care about fights a new diagnosis. A mom hurts for her child’s pain. Divorce rips apart a family while the child pretends nothing is wrong at school. I look around and truly, we are just pretty messed up. This is NOT how God created us to be. It’s not good. But “messed up” isn’t how God leaves us. I believe He did create us with higher expectations and plans for our happiness and living in peace and love. Mankind chose a different path. Stupid, huh?! Everlasting. Not based on my goodness, my beauty or my success. Just everlasting. In Romans 8 God reminds me that NOTHING can separate us from His love. Not ugliness, not cancer, not divorce, not mental illness. Nothing. 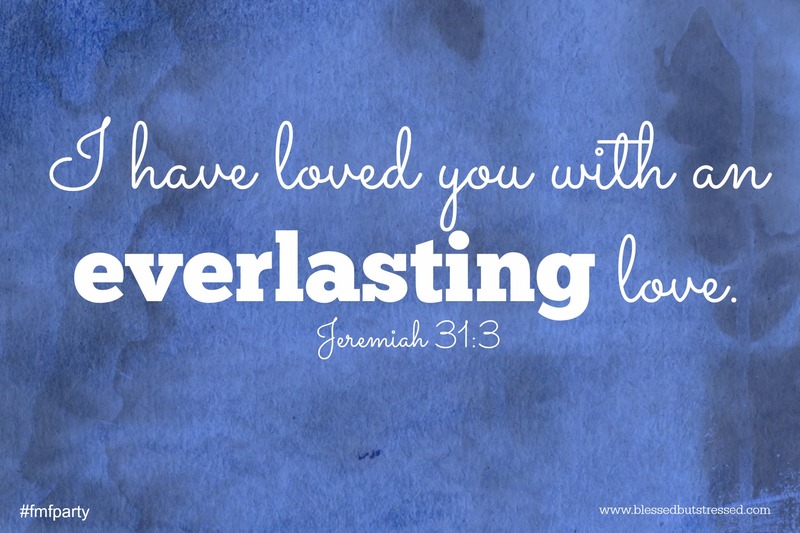 We are loved with an everlasting and unconditional love.